Sea, Sand & Sky: The Best Thing Since The "Dream Team"
The Best Thing Since The "Dream Team"
Today I had an amazing day on Georges Island, being on a different site again was a little frustrating but hopefully this is my final stay. I built a strong team relationship alongside my coworkers today and with the children. Some would say playing wiffle ball at work is lame but hey, I enjoyed it especially pitching and showing off my Kevin Youkilis stance when batting. It was all fun until I had to show my inner strengths! Tagging alongside Paige Academy, we created the ultimate team.... TEAM FLEX! 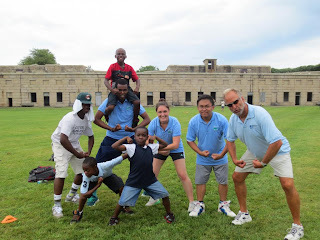 Team Flex was founded while playing wiffle ball and Paige Academy student Ricardo came up to me and asked to play kickball and we created the greatest team since the Dream Team! It was a lot of fun playing with Team Flex especially me being the founder because we live off the basis' of not losing, we were down 3-0 until we came back and did what we had to do which was winning at the end with Ricardos home run to bringing a couple bases home. At the end of the day we won a lot to a little, also known as 15-13 in the last inning. It was a great day and a wonderful way for me to start All Access and bond with the kids because next week I shall swim with the kids from Revere Public Schools who did not get a chance to enjoy the fun times of Team Flex!